Rochelle was really angry now, but she just turned around and went to her desk. She took out a pad of paper, grabbed the email, and went for a short walk. 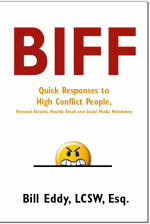 She decided to send a BIFF response as an email to the project manager, with a copy to Phil. Brief? Yes. Just a paragraph – the ideal length for most BIFFs. Informative? Yes. She explains what is being done. She reassures Jim that they are on a schedule. She indicates that she is open to questions, rather than being defensive. Friendly? Yes. She’s friendly to Jim by being helpful, without being antagonistic to Phil or negative about him. Of course, Phil could consider the email to Jim itself as a hostile act, so she will need to be prepared for him to be upset. Firm? Yes. It ends any questions about her work that were raised by Phil’s email. She also printed this out as a memo to Jim, so that it would be filed with the other important papers of the project, rather than deleted as a simple email. Phil was furious. “What are you doing!? !” he demanded. Rochelle resisted the urge to make her memo a personal attack on Phil. Instead, she kept the focus on what is being done, not what wasn’t being done or what had been done wrong. Before Phil could get too upset, she changed the subject to his weekend plans – a subject that he loved to talk about. By being calm, Rochelle was able to keep Phil from getting too heated up over her memo. With many HCPs, changing the subject to another subject about him often helps keep him from getting stuck in his anger, more than directly confronting his anger – which escalates it. Of course, this doesn’t always work, so you have to be careful in how you manage your HCP boss – or any HCP. By quickly getting accurate information to the project manager, Rochelle at least created doubt in his mind, before the misinformation settled in Jim’s mind as a “fact.” Such facts could have quickly been passed on to other managers, so timing was very important. Putting it in writing was essential, so that when someone someday looks back in this project’s file, they see Rochelle’s response right next to Phil’s false allegations about her. The effect of this is to at least create doubt in the reader’s mind—even if the reader doesn’t automatically believe Rochelle. Without her written comment, a reader would take Phil’s comments as unchallenged fact—because they sound so believable woven into his reasonable-sounding email. Of course, an employee has to be careful in going over a supervisor’s head. In general, it is considered inappropriate. But if you look carefully at the way Rochelle wrote her email memo, it had several important BIFF characteristics that helped. 1. She didn’t criticize Phil at all. She resisted the temptation to say that he lied or distorted the facts. 3. She said what she has done (she always was on schedule) to protect herself, rather than correcting Phil for falsely saying what she hasn’t done. 4. She explained it to Phil as helping both of them in the eyes of the project manager. 5. She confidently changed the subject to Phil’s weekend plans, which sometimes works with HCPs (but not always). You have to evaluate your own situation. This example demonstrates a written BIFF and a verbal BIFF. First, Rochelle wrote the BIFF to the project manager. Then, she responded to her boss’ irritation with her with a verbal BIFF response. It was brief (just five sentences), informative (“just telling the project manager how we are coming along”), friendly (“we’ll look good to the project manager”) and firm (changing the subject to his weekend plans).